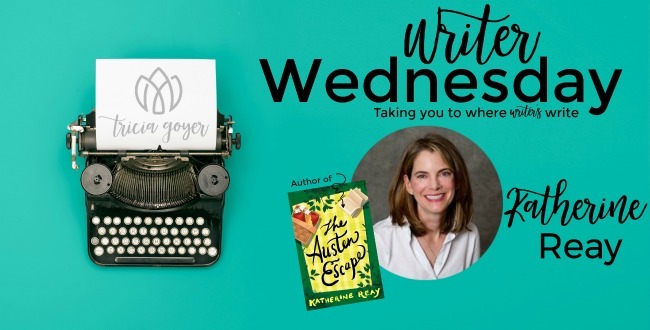 Enter below for a chance to win a copy of Katherine Raey’s The Austen Escape! Welcome to my office! Here is where I spend the vast majority of my time. I’m not a writer who enjoys coffee-shops, airports, doctor’s offices or carpool lines. I can’t fully concentrate out and about in the world so I really do write only here – or I should say I only write comfortably here. This particular desk is a fairly recent investment for me. A few years ago I hurt my back hauling heavy furniture and training for a marathon. I tweaked it during our move then made it worse by not easing off on my running schedule. It all ended with a herniated a disk and a right leg that was tingly most days. I soon found long stretches of sitting made the numbness worse and, after extensive research, I found this… I love it! It goes up and down at the touch of a button. I now spend most days traveling up and down and writing at all points in-between. You also see around my office my Elephant Collection. I suspect I’ve always loved elephants because I’m very like one – no vertical jump, horrid looking knees, loyal, long memory, and, I too, eat a lot. My husband gave me the one directly above my computer, as well another large print I have yet to frame. The lovely one with the red balloon was a gift from a reader/new friend. It is drawn atop a page from a Spanish encyclopedia – words and elephants! An ideal combination! I’m not sure how well it comes across in the photo, but my walls are lined with corkboard. I saw this treatment in a magazine and fell in love with it. It means that every year – more often if I’d like – I change out the major players on the walls. And I’m always pinning up new small things like character sketches, to-do lists, the kids’ sports schedules, etc. So that’s my space… Now what do I do in it? I try to write. Writing the manuscript-in-progress each and every day is the goal for me, but that doesn’t always happen. Right now I have one story about to launch, The Austen Escape which hits online and in stores on November 7th, and I’m beginning another. Every day is filled with marketing the one and “laying down words” for the other. First drafts, for me, are a quick-paced-uncensored building project. I try to focus more on laying down words in a fast, un-edited fashion, than I try to craft those words into a refined story. If I start to edit, I start to criticize. There are times, of course, I must go back and solidify early scenes in order to move forward, but for the most part I race through scenes and emotions laying down the raw gems I’ll refine later. 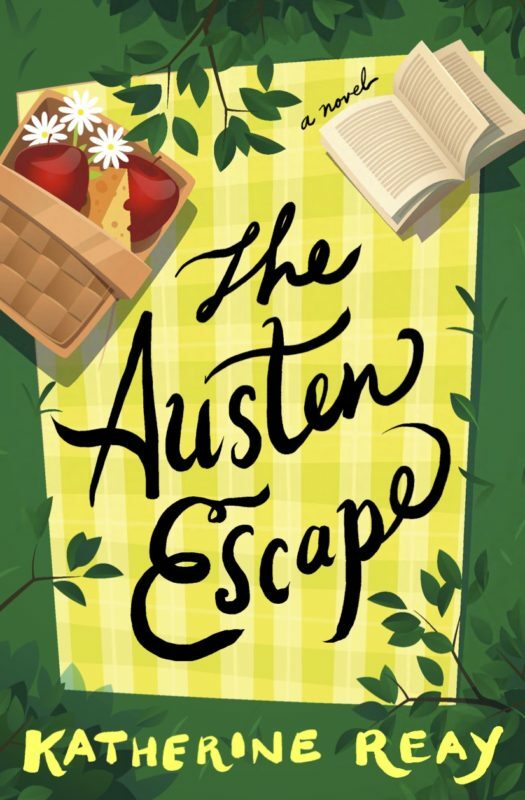 As for marketing The Austen Escape, there are articles and blog posts to write, conversations on social media to hold and replies to reviews to send out. I fully believe that if a reader tags me in a review, reaches out on Facebook, or writes to me directly, she has honored me with her time and I try to respond likewise. It’s tremendous fun meeting readers and bloggers in this way. The misunderstanding about we introverts is that we’re shy – get us one-on-one and talking about a subject we love and we can get very chatty. Love your office. 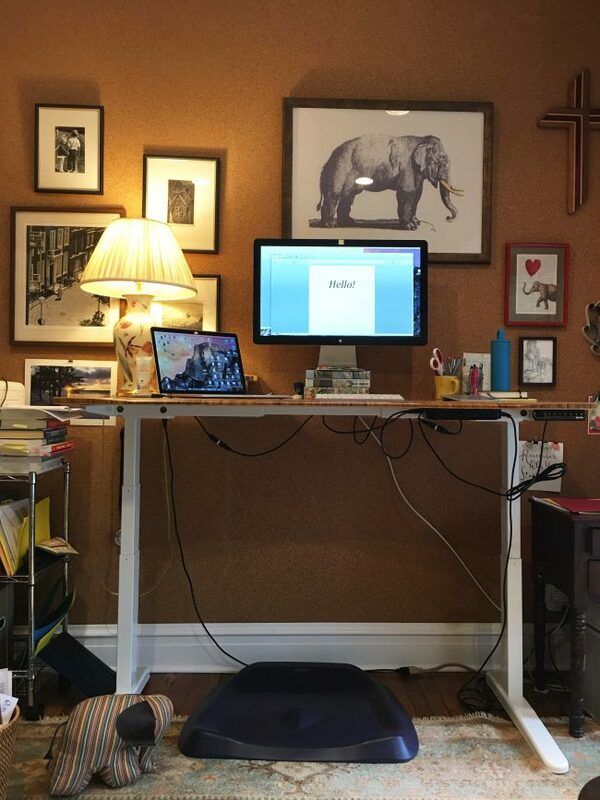 Your desk is awesome and would love to win a copy of your book. You are a new to me author that I would like to get to know through your writing. Have a great Thanksgiving . Great office. Love the cork board idea. Wish I could do it but we rent. I am just going to start Dear Mr. Knightley. Thanks for the glimpse into your writing life. Wonderful. I hope you enjoy Dear Mr. Knightley. Thanks for stopping by.